Preheat oven to 180*C. Line two 22cm springform cake tins and spray with cooking spray. Separate eggs, placing whites in clean large mixing bowl. Place egg yolks in a small bowl. In another clean bowl, sift all dry ingredients. Add oil, water and vanilla. Beat for 2min. Add egg yolks and beat for a further 2min. Whip egg whites until stiff and fold into chocolate batter with a spatula. Pour I to cake tins and bake for 20-25min or until firm to the touch and a skewer comes out clean. Place cream in clean bowl. Sift icing sugar and cocoa over. Whip cream until stiff. Break chocolate into a bowl. Melt chocolate over simmering water. Do not stir until chocolate has completely softened. Test with tip of teaspoon. Stir in milk. Meanwhile, sprinkle gelatine over water. Microwave on medium until gelatine is just melted. Add to chocolate, stirring as you do this. Beat egg yolks until pale yellow. Pour in chocolate and Beat in vanilla. Beat cream until stiff. Beat egg whites until stiff but not dry. Add both to chocolate mixture and fold in gently with a spatula. Refrigerate for 10min. Line the base of one of the baking tins with baking paper. Place a cake layer in the baking tin and spread with mousse. Then place a layer of cake on top. Then spread with a layer of cream. Top with cake, then mouse then cream. End off with cake. Place in fridge for at least 3-4hrs and allow mousse to set. 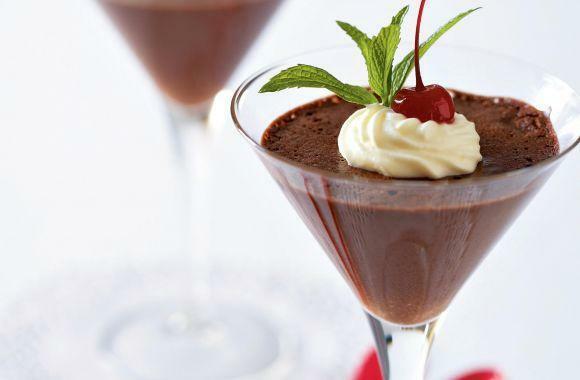 Melt chocolate with cream over low heat. Allow to cool slightly, then pour over cake. Decorate with rose petals and chocolate curls.